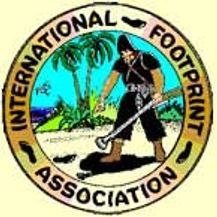 Our slogan, "Bigger and Better Footprints", relates to the both the symbol and purpose of our organization. Our symbol, Robinson Crusoe finding Friday's footprints on the beach, depicts the beginning of a relationship that ultimately leads to excellent cooperation between Crusoe and Friday. This type of cooperation between everyone involved in law enforcement and all law enforcement agencies, as well as private citizens, business and professional people, was the goal of the original eleven Footprint organizers back in 1929.